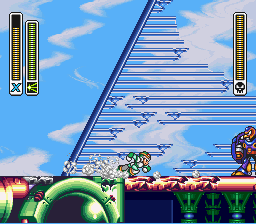 Taking place at a large airport (and in the sky), this stage features a heart tank, sub-tank, and helmet upgrade, which allows you destroy breakable blocks with your helmet. It's also short and features no sub-bosses. Keep jumping on the moving platforms until you get to the top. 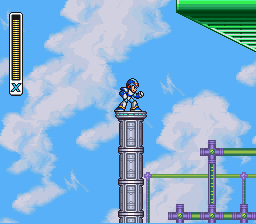 You'll begin this stage on a large platform at the bottom left of the map. Your goal is to reach the far top right area. 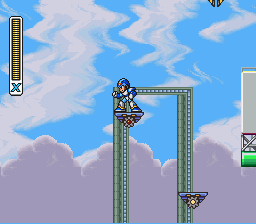 First head right and jump on one of the moving platforms, but be wary of the sky claws that will attempt to grab you. When on a moving platform, you're extremely vulnerable to getting caught; and the end result is usually a nasty fall into the pit below. Your best bet is to use some of your tools, like Chameleon Sting or Boomerang Cutter to take them out while they are above and away from you. Don't be afraid to bail and jump on another platform, it would be better to waste time on that than to risk dying. 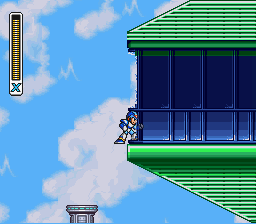 When you get to the very top, dash jump to the left from the moving platform you're currently on; if you jump far enough, you should land on a roof where a heart tank lies. 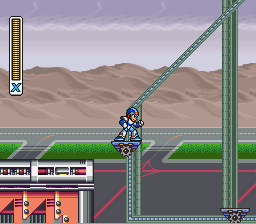 Jump down and go on the moving platforms again, but this time, jump to the right instead of the left once you reach the top. Dash jump to the left once you get to the top. You should land on this roof with the heart tank. You'll notice a cannon on a large rising elevator: destroy the cannon and then hop on the elevator, which will bring you near a window. Shoot the window and jump inside. 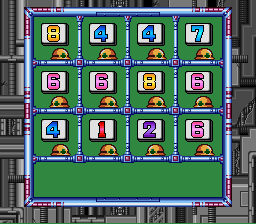 Keep going to the right and destroy the Blaster, who's guarding a valuable sub-tank. Take it and destroy the flamethrower on the moving platform, then jump on it. You have to get to the other side of the area by going across these moving platforms: all of them have flamethrowers, so stay on the previous platform in order to destroy the next flamethrower from a safe distance. Break this window and destroy the Blaster up ahead. Take the sub-tank and then jump on the moving platform to the right (after destroying the flamethrower on it). Step inside the capsule to receive the Helmet Upgrade. 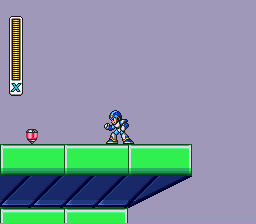 This allows X to destroy breakable blocks (such as the ones next to capsule) and can be used to get another useful upgrade. Once you encounter a large wireframe structure, scale it and jump down on the other side. 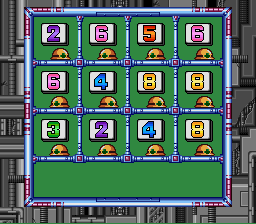 Destroy the explosive canisters on the platform above, which will create a passage leading to capsule. Jump down here to reach the area with the capsule. Destroy these canisters to finally reach it. 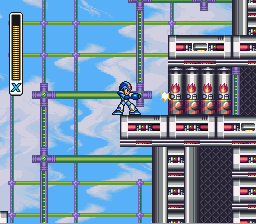 Go on the platform to the right of the wireframe structure where you'll encounter a large combination of sky claws and mettools. They're easy to destroy and can even be evaded. 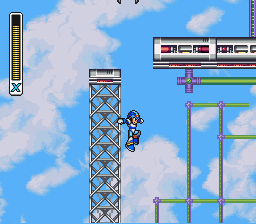 When you get to the end of this area, you'll have to jump on some platforms that fall as soon as you touch them; work your way across them as fast as possible and then jump on the airplane. Destroy the two cannons and then enter the dungeon to fight Storm Eagle. If you walk off the right side of the platform with those cannons, you may find some supplies. 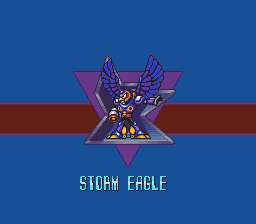 Storm Eagle is probably the easiest boss in the game, since most of his attacks are actually attempts to push you off the edge of the map. He'll either flap his wings to push you off or fire a tornado projectile that does the same thing. His two damaging attacks are dropping eggs that split into several birds and dive bombing. If he takes to the skies, he's about to divebomb. Simply dash in one direction until you see him coming, then either 1) keep moving in the same direction, 2) switch directions or 3) jump. 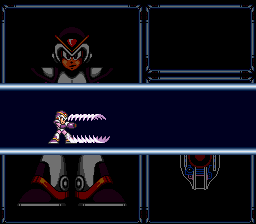 Alternatively you can use this time to blast him as well; if he dive bombs you, dash in the opposite direction, turn fire and then get out of the way if you need to. You must be very quick to do this without taking a hit. After dive bombing, Storm Eagle will hover down from the top of the screen and attempt to throw eggs at you. 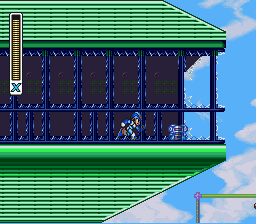 Use Chameleon Sting or a fully charged Mega Buster shot to hit him while he's up there. 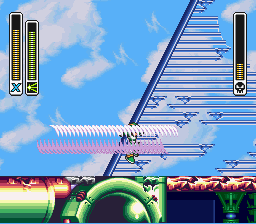 If you hit him right when he starts hovering he'll end up ignoring this attack phase and either return to dive bombing or land and attempt to blow you away. 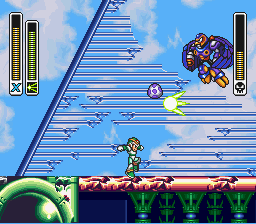 The best time to hit him with Mega Buster shots is when he's just on the ground; don't even bother powering up your shots since you'll be able to hit him so many times with regular ones. 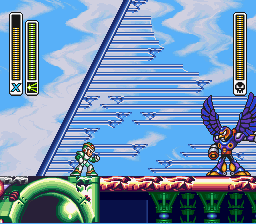 However, Chameleon Sting is always the way to go in this fight. You can hit him while he's hovering above you easily with the Chameleon Sting, so make sure you do if you have the opportunity. 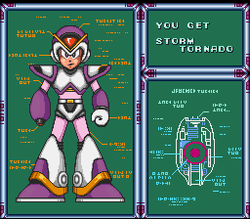 Storm Tornado! This fires a large gust of wind that can easily destroy multiple enemies. It can also go through walls. This page was last edited on 15 October 2018, at 18:39. This page has been accessed 115,439 times.